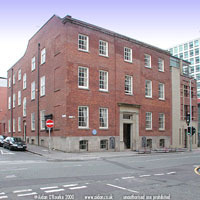 COBDEN HOUSE, 19 Quay Street, is situated between Deansgate and Granada Television. Its plain facade may not look very impressive - to the untrained eye it almost looks like - heaven forbid - one of those imitation Georgian houses built in the 1980's - but this is one of the oldest and most stylish houses in Manchester, with fascinating historical associations. The last Georgian house to be constructed in Manchester, it was built in 1775 for the wealthy Byrom family. Subsequent owners included industrialist William Hardman, the Heywoods, a family of bankers, and solicitor Oswald Milne. In 1836 the house was bought by Richard Cobden, one of the most remarkable public figures in Britain during the 19th century. His campaign ended the Corn Laws in 1846, permitting the expansion of Free Trade. From 1851 to 1873 the house became Owens College, forerunner of Manchester University. The location was chosen despite the unwholesome attractions of the nearby 'Dog Inn'. In 1878 it became the Manchester County Court and continued in court or court-related use until 1990, by which time it had suffered serious neglect and deterioration. In the mid-1990's a group of barristers took on the building, restored it to its former glory and moved their offices here, renaming it Cobden House Chambers. "RICHARD COBDEN, M.P. a pioneer of Free Trade lived here 1836 - 1843. 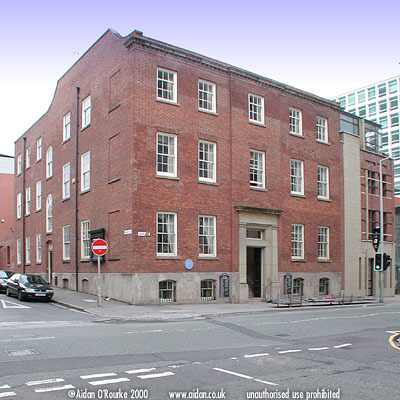 Owens College (later Manchester University) occupied the building 1851 - 1873"
This is the text of the blue plaque put up by Manchester City Council on the facade of Cobden House Chambers, 19 Quay Street, to commemorate its historical importance. COBDEN HOUSE CHAMBERS is the former home of Richard Cobden, the influential MP and reformer. He lived here from 1836 to 1850. 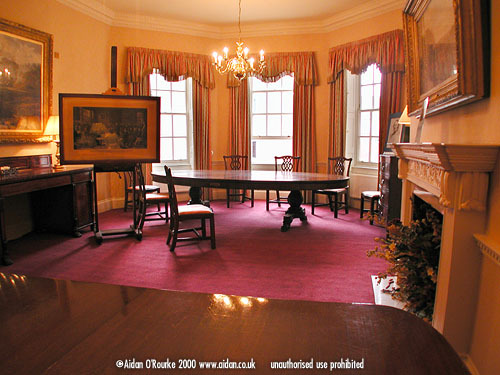 On the occasion of the Heritage Open days, 16 and 17 September 2000, the table owned by Cobden was lent to Cobden House Chambers and put on display. In this very room and around this very table, Cobden held meetings with other reformers with the aim of repealing the Corn Laws. The picture on the left shows Cobden presiding over one such meeting, and on the right is a pencil portrait of the great man, whose presence you can almost feel in the room. Thanks to Stuart Neale and Adrian Farrow, Members of Cobden House Chambers, for a very interesting guided tour on Heritage Open Days 2000. 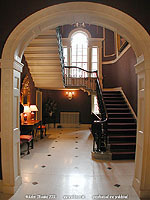 THE ENTRANCE HALL of Cobden House Chambers is seen here, displaying the superb restoration job commissioned by the Members of Chambers who now occupy this historic building. The staircase is of special interest, due to its elegant lines, shallow steps and daring execution. The metal bannister plays an important structural role - without it, the staircase would collapse. The furniture and colour scheme have been chosen to recreate how the house probably looked in the early Victorian period. 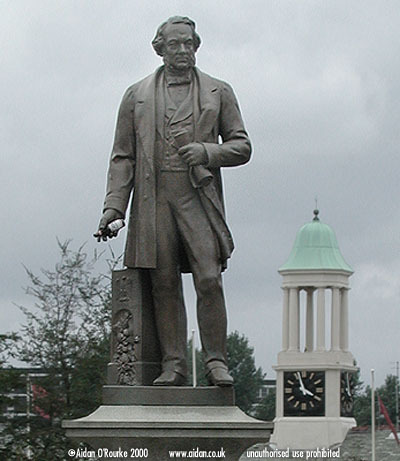 THE STATUE OF RICHARD COBDEN stands here in St Peters Gate Stockport, with the clock tower of the Co-op visible behind. Richard Cobden was born in Sussex, started a business in London, but moved to Manchester to buy a calico printing factory. He was highly successful, and was elected to the Manchester Chamber of Commerce in 1836. He conducted a campaign to have Manchester incorporated as a city, and this took place in 1838. He then campaigned for the repeal of the Corn Laws. The Corn Laws were a tax on corn originally intended to defend home markets against cheap foreign imports. But during the early 19th century they were used by the aristocracy as a means of gaining wealth, and became a barrier to free trade. 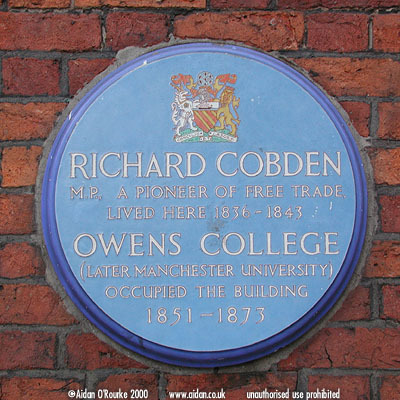 Cobden's campaign culminated in the repeal of the Corn Laws in 1846, opening the way for free trade, the foundation of Manchester's wealth. I wonder if the person who put the beer bottle in Cobden's hand (picture left) knew any of these interesting facts. 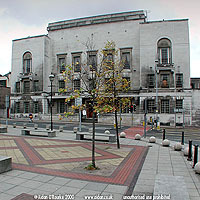 THE MASONIC HALL is situated on Bridge Street and is the home of the Freemasons in Manchester. Plans for a new building were first discussed in the 1900's. By 1913, money was raised, but the First World War caused the plans to be put off by many years. The building was designed by architects Thomas Worthington & Sons, and opened on 24th of October 1929. 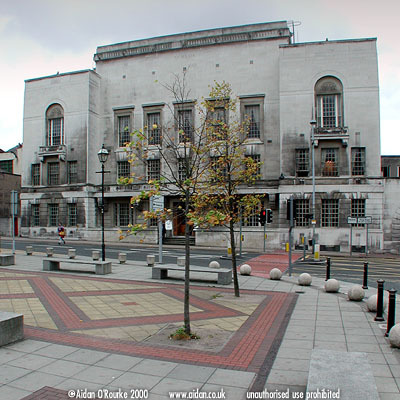 THE MEMORIAL HALL of the Masonic Temple is seen here - we are looking back towards the main entrance on Bridge Street. 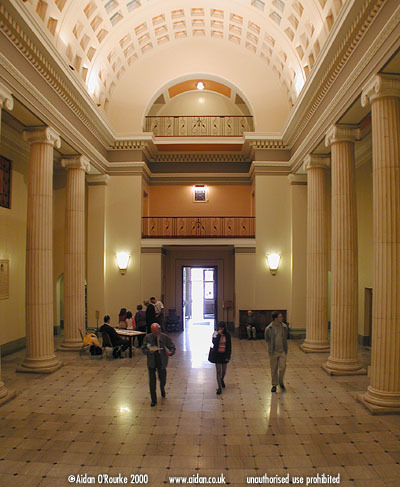 This magnificent hall is strongly classical in inspiration, with its row of ionic columns and Roman coffered barrel vaulted ceiling. This entrance hall reminds me of stately homes such as Kedleston Hall, built in the 1700's. But the Masonic Temple, designed by architects Thomas Worthington and Sons, was opened just 71 years ago in 1929. 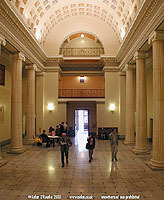 On the weekend of Saturday and Sunday 16/17 September 2000, the public were invited to view the building, as part of the Heritage Open Days. 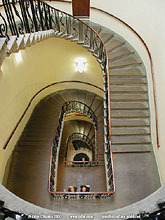 THE SPIRAL STAIRCASE of the Masonic Hall, leads from the ground floor right up to the top of the building. There are 90 steps. For masons the staircase has a symbolic value "A true symbolic spiral staircase leading to the light above" (taken from the pamphlet published by the Friends of Freemasons' Hall). 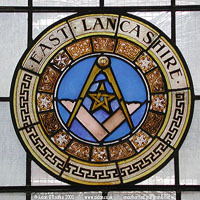 THIS STAINED GLASS WINDOW at the Masonic Temple, Bridge Street, shows the divider and set square, symbols of the Masons. Other motifs have a Celtic and perhaps religious significance. The Freemasons are a society with origins going back to the craftsmens guilds of medieval times. 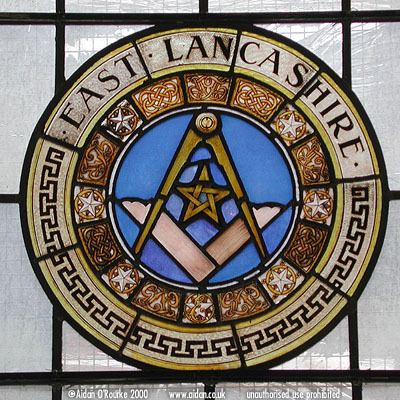 Their arcane sybols and rituals have often been shrouded in secrecy, though in recent years, there has been a move towards greater openness: For instance, the Masonic Temple in Manchester opens its doors to anyone who want to hire rooms for conferences, weddings or other events.